It was then that I was reminded that their homes don't contain lots of stuff, just essential living things. Thank the Lord we're all different. They then said I should get one, 'but what about my stuff?' I cried, 'I don't want anyone touching my stuff' lol. It dawned on me the reason I like housework, it's because it doesn't feel like housework. My home is carefully curated every few days to match my mood. I'm a constant faffer, and revel in collecting beautiful nik naks (lucky, as that's also what I do for a living), and styling them into interesting vignettes around the home. I imagine it's like playing with a huge dolls house, but it's my home. I've always loved intricate detail, I prefer always to see snippets of a room then the whole thing, so my collection of things are always quite small. I love vintage china and flowers, and use these a lot to dress my home, don't get me wrong, it's not a museum, hell no, it's a family home with a dog and the odd chicken sometimes wandering through lol. Actually, I think it would probably be a cleaners nightmare ha. -smile- Yes, it probably would be a cleaner's nightmare! Worried they would get in trouble, not putting something back, in its proper place and etc. So it's good, that you love doing your own cleaning! And how lucky you are! To view what you do at home, as playing with a big doll house. How very, very lucky. What a perfect way to look, at home care. Blessed with a giant dolls house 😊 Thank you for your lovely comment. I thought I was the only one not to let a cleaner touch my stuff! 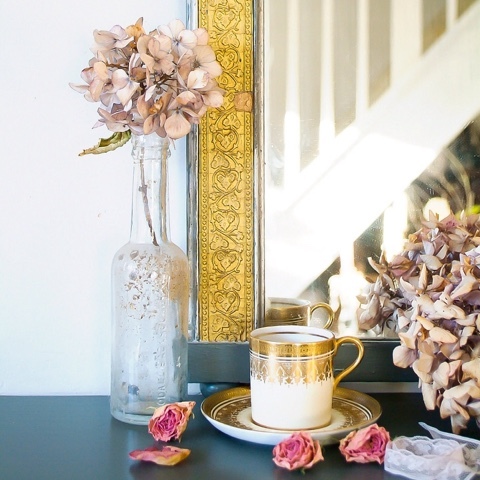 Hooray for beautiful created homes and faffing with pretty things!